Performers include: Robby Benson, Michael Horton, Noelle North, Alan Oppenheimer, Efrem Zimbalist Jr., Samantha Eggar, James Avery, Tim Curry, Jeff Bennett, Jack Angel, Bob Bergen, Patty Duke, Andrew Stevens, James L. Avery Sr., Dorian Harewood, Peter Renaday, Marnie Mosiman, Dan Gilvezan, Tony Jay, Brian Cummings, Diane Pershing, Neil Ross, Rob Paulsen, Simon Templeman, Diana Muldaur, Clive Revill, Jameson Parker, Jeff Bennett, Jack Lynch, Michael York, Paige O’Hara, John Rhys-Davies, Wil Wheaton, David Warner, Gregg Berger, Teri Garr, and Stephen Wolf Smith. 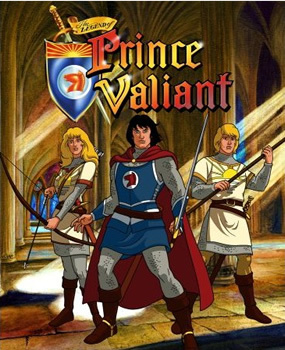 After a brutal attack by a ruthless tyrant named Cynan (Tony Jay), King Willem of Thule (Peter Renaday), Queen Briana (Marnie Mosiman), and their son, Prince Valiant (Robby Benson), are forced to abandon their castle and flee their rightful home. They finally find peace on a desolate and remote island in the marshes. Weeks later, the prince has a dream about Camelot, a place where there’s order and justice. Compelled by his dream, and against his father’s wishes, Valiant sets out for Camelot to one day become a Knight of the Round Table. On his journey, the brave prince meets a shy but savvy peasant named Arn (Michael Horton) who helps him understand how to survive in the forest. After battling and defeating a river monster and an ogre, they become close friends and Arn agrees to go to Camelot with Valiant. While in search of a blacksmith to repair a broken dagger, Valiant and Arn stumble into a fight in the village of Bridgesford. The newly appointed sheriff is trying to claim the blacksmith’s unwilling daughter, Rowanne (Noelle North), as his wife. Val and Arn help rescue her but she’s no typical helpless maiden. Her father, Cedric (Brian Cummings), consents for Rowanne to accompany them for her own safety and so that she can pursue her own dream of going to Camelot. The trio eventually arrive at the legendary kingdom and are imprisoned. With the help of the wizard Merlin (Alan Oppenheimer), they are freed and help uncover a traitor in King Arthur’s court. Though Arthur (Efrem Zimbalist Jr.) is skeptical, Valiant, Arn, and Rowanne win Queen Guinevere (Samantha Eggar) over and she convinces her husband to let them stay and begin their training. King Arthur is sick and unconscious in bed from a fever as Mordred attacks. The beautiful Aleta of the Misty Isles joins forces with Camelot to help defeat Mordred. Sir Bryant and Sir Gawain are captured by the Vikings and the knights are pressed to reveal military secrets but steadfastly refuse. As Mordred’s army gains force, even Valiant thinks that the battle against his enemy will not be won. Fortunately, King Arthur is awakened in time to return to Camelot. The sight of their king so inspires his followers that they are able to defeat Mordred and his forces. Against the most challenging odds, Camelot proves triumphant and King Arthur and his ideals are upheld.